Stature is Hoyer's flagship product which recognizes the true needs of the modern care environment. With a safe working load of 500 lbs. and a broad lifting range, the Stature is able to cope with the most demanding and technical resident handling situations. Straight mast design enables residents to move comfortably and safely at a consistent distance from the equipment. 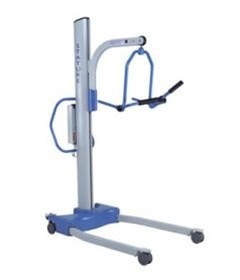 Scalloped base allows the caregiver to get close to the lifting load, which helps keep the caregiver in a more ergonomic position while performing the lifting task. The Presence cradle can be ordered with an optional scale to simplify resident weighing activities. Maximum Height to Attachment Point: 4 pt Cradle: 61.0" - 6 pt Cradle: 77.1"
Minimum Height to Attachment Point: 4 pt Cradle: 15.4" - 6 pt Cradle: 26.6"